Choosing the perfect venue is one of the biggest moments in your engagement. This is where your perfect day will unfold. Everything has to be just right. That natural light has to fall in through the bay windows or the dance floor has to sit perfectly under a gorgeous custom light piece. Somethings that are less photographic but just as important: how many restrooms are there? Is there wheelchair access for your great grandma Betty? Do they have preferred vendors or can you hire outside of them? What time does the rental begin and end? Is there a Planner there that will help the day of or only up until? Do they include a ceremony rehearsal the night before? The list can go on. If you know exactly what you want or need before touring, this can save you a lot of time .. and stress. The day of the tour, you know exactly what you're getting into and whether or not they are a good fit or not! This helps narrow your search and hopefully lead you to The One. This French-style chateau is built on 28 acres and 10 minutes out of town. It's secluded and private. This venue is extremely elegant and charming. The rental is 12 hours that includes a Day Of Coordinator as well as set up. They can host up to 280 guests in the Grand Hall. The Hall is modern with gorgeous wood floors and ornate chandeliers. The iron used throughout the venue leaves clean lines, perfect for a photographer. Outdoors they offer a beautiful fireplace with custom seating and bistro lighting. Lastly, the wedding team they have onboard are nothing but a dream. They are extremely helpful and happy to help your every need. Sitting just across the river in Alton, Illinois lies this sweet venue. It's a privately owned furniture store with an intimate feel. When you walk in, you immediately feel at home. When you arrive into the event space it's modern and extravagant. 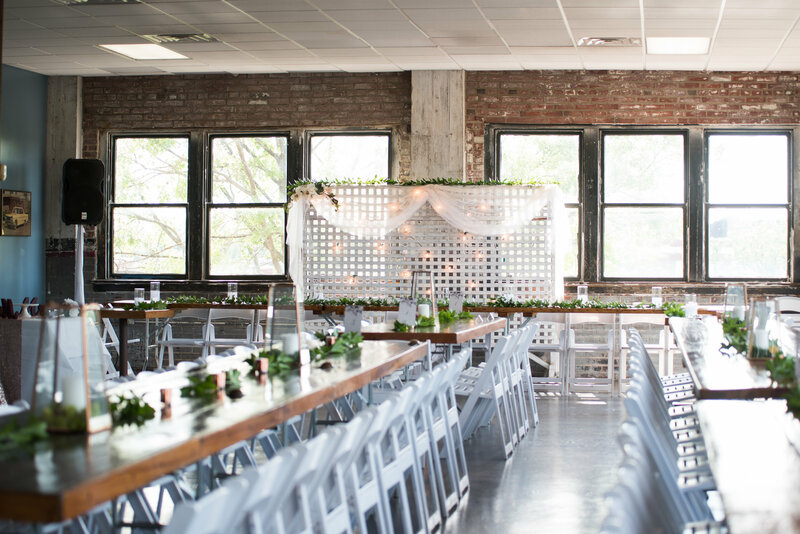 The details in the framework along with the exposed brick are perfect for a backdrop to any photo. The venue has two separate rooms, 1 for ceremony and 1 for the reception. You are welcome to use the reception space as 1 for a flipped room as well. Last but not least, the chandeliers aren't only the anchor to the room, but also leave the desired lighting throughout the night. Historically known as the Olde Wickes Organ Co. This venue is over 40k square feet split into multiple options. The first option is the Stained Glass Hall (originally the Pipe Organ Showroom) which offers stunning custom stained glass and exposed bricks. This site can host up to 120 guests. Did I mention the heated cement dance floors? Next option is the North Patio situated perfectly under old oak trees. This site can host up to 200 guests and offers a gas operated fire pit and outdoor lighting. Lastly, the famous and well known West Hall. 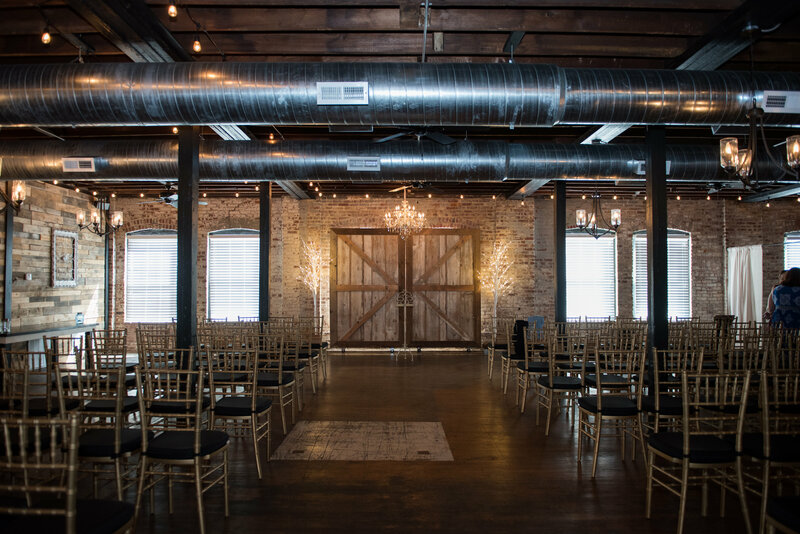 With its original architecture, rustic hardwood floors, exposed brick, and custom chandeliers, it's hard to not stare at the space. 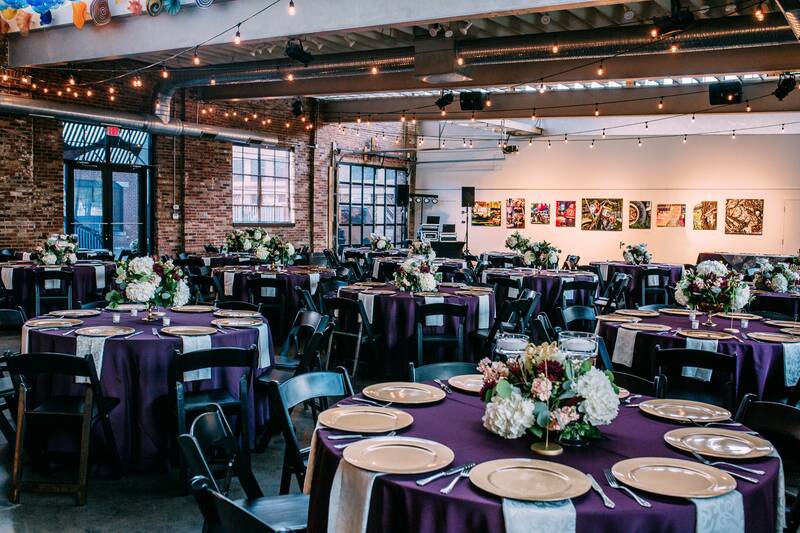 Carefully restored and magically transformed into a one of a kind urban art gallery, is this perfect spot to any event. 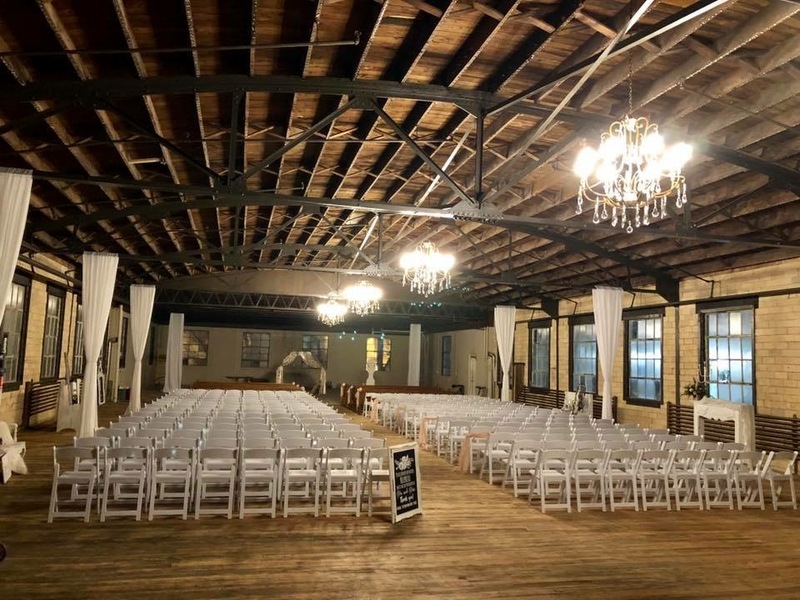 With 6,000 square feet of open space, this venue can host up to 225 guests. They offer glass ceremonies in which the couples can choose the color of glass as well as the custom glass piece they would like as a keepsake. During your ceremony, they will even offer the vases to help pour the glass together, forever unifying your unity to one another. Couples portraits can be taken from the sidewalk outside in front of a colored garage door as is the tradition at this venue! It has a modern feel combined with a sense of artistry. They allow you to bring your own vendors as well. Known for its rooftop accommodations, this venue is nothing but charismatic. Open sky dining and space on the roof for every event allows this venue to offer something many others can't: a skyline of the city of St. Louis. They can accommodate up to 250 guests and if weather is unruly, they offer an indoors option as well. The staff greets guests as they enter, starting the night off right! 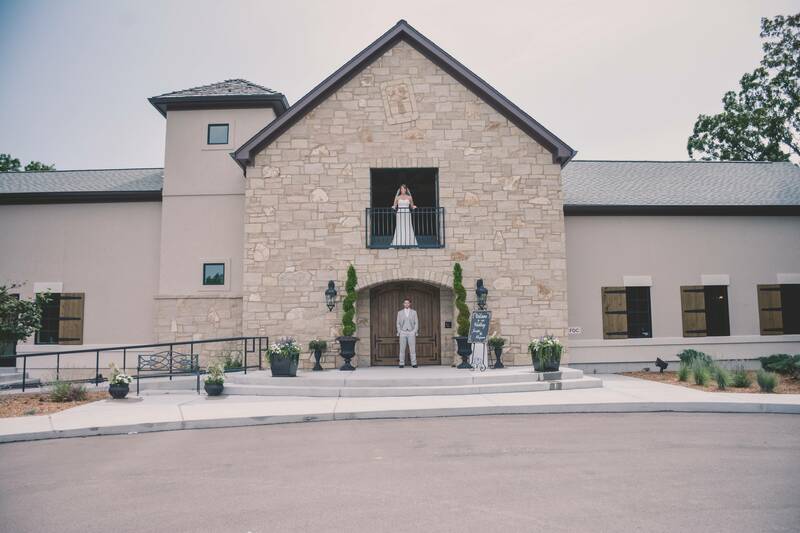 We hope this helps you in your search for the perfect place to get married or celebrate! Connect with us on Facebook and Instagram to find quick information and insights on our wedding DJ services.